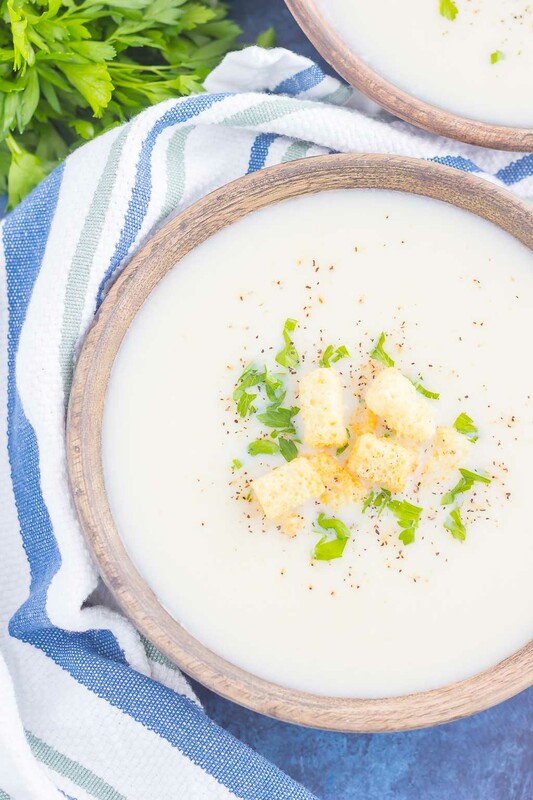 This Creamy Cauliflower Soup is the perfect comfort dish for those chilly nights. Made in one pot, bursting with flavor, and ready in 30 minutes, this simple soup will warm you up all year long! Have I mentioned before that I love soup? Because I do, I really do. In fact, I usually eat soup once a week. It’s my go-to dish if I’m not feeling leftovers for dinner or when the hubster isn’t home to cook for. I could practically eat soup every day (even in 90 degree weather), as it’s one of my favorite comfort foods. And now that the colder weather is settling in, you can bet that I’ve been on a major soup kick lately. 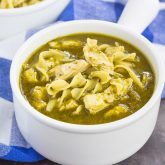 From this Easy Black Bean Soup, to that Creamy Tomato Tortellini Soup and this Slow Cooker Chicken Tortilla Soup, it’s been a regular in my house lately. I just can’t get enough of the warm and cozy flavors and textures. 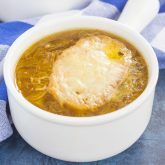 I love experimenting with soup recipes, and I think I’ve found a new winner! 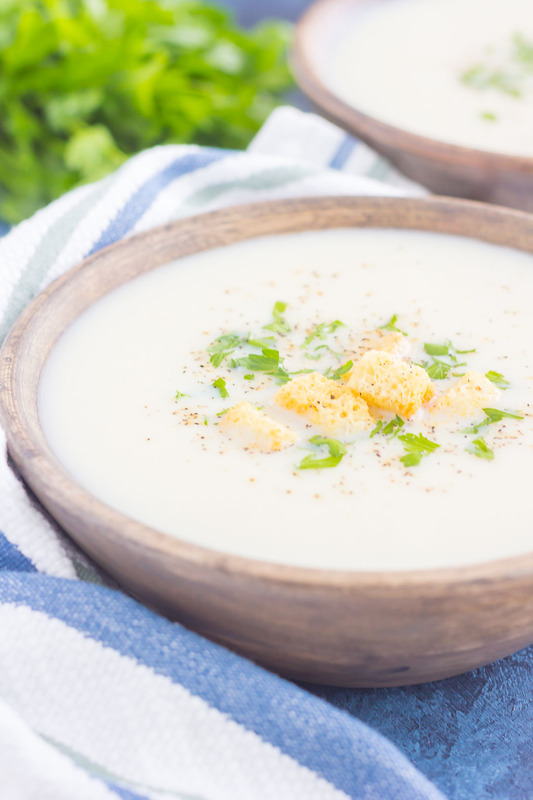 If you’re looking for an easy and comforting dish, this Creamy Cauliflower Soup is it. Packed with simple ingredients and loaded with a thick and creamy texture, you’ll be wowed after just one bite. Truth be told, I’ve only had cauliflower soup a handful of times before. But, ever since I tried it, I was hooked on the taste and texture. Simple, yet elegant, and made with cauliflower? My mind was blow. So, of course, a version of this soup has been on my food bucket-list for quite some time now. 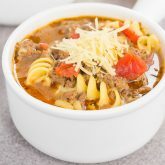 And did I mention how easy this soup is to make? So easy, friends! But, you knew that was coming, right? Everything gets tossed together in one pot, and then blended until smooth and creamy. Easy peasy and oh-so delicious! 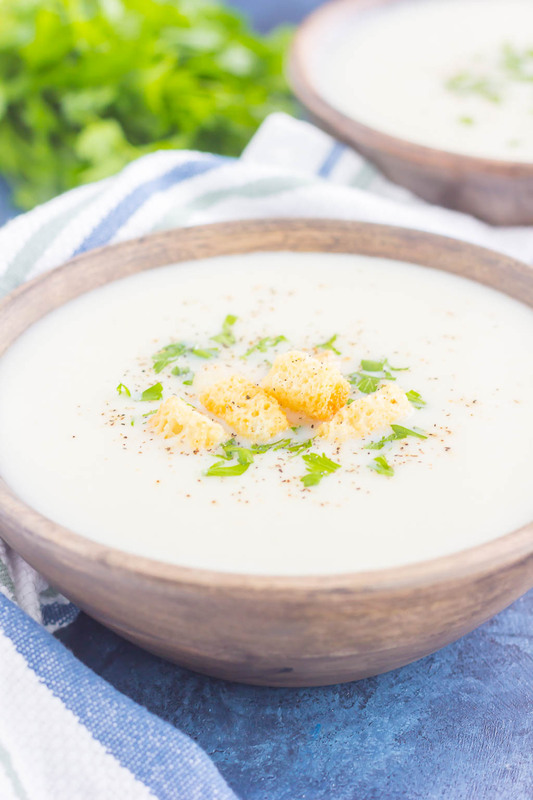 So if you’re looking for that perfect, cozy dish that’ll warm you up this season, you’ll fall in love with this Creamy Cauliflower Soup! In a medium soup pot, heat olive oil over medium heat. And onion and garlic. Saute until tender, about 2-3 minutes. Add cauliflower and broth. Bring mixture to a boil. Once mixture is boiling, reduce heat to low, cover, and simmer until cauliflower is very tender, about 15-20 minutes. Remove from heat and use an immersion blender to puree soup. Alternatively, you can transfer soup in batches to a blender and puree this way. Add milk, Parmesan cheese, salt and pepper to pureed soup and stir to combine. I used the pre-cut cauliflower florets that I found in the refrigerated section of my grocery store's produce department. This makes prep time easier! I absolutely LOVE soups too, Gayle! They just give me all the warm and cozy vibes. 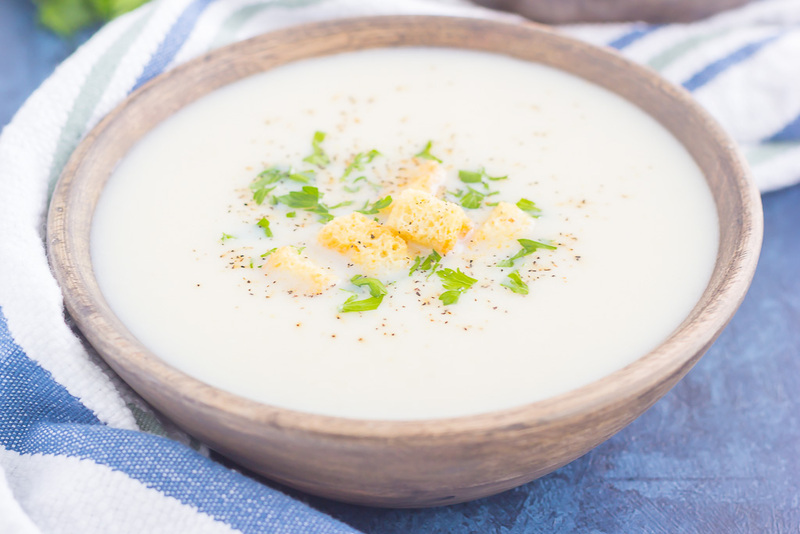 And any kind of cauliflower soup is one of my favs! This one looks super creamy-dreamy!! Plus I love that it's a cinch to throw together! SOUP GOALS! Pinned! Cheers! Thanks for the soup love, Cheyanne! I'm on a huge soup kick these days too!! It's just the best meal ever this time of year. 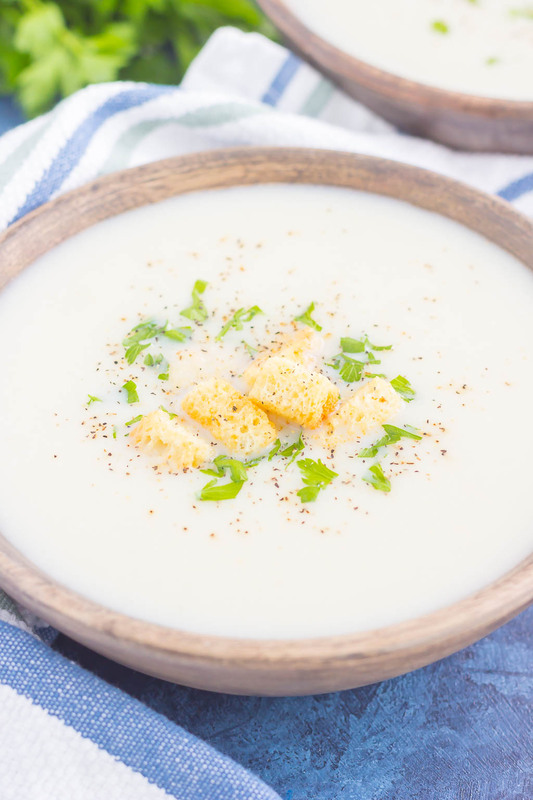 :) I LOVE how smooth and creamy this gorgeous cauliflower soup looks, Gayle! This is my kinda dinner. I love soup too! This one looks super creamy , Gayle - perfect for today (we have snow) we some garlic bread. I think I could eat soup every. single. day. I love vinegar in mine. Wish this was on the menu for lunch today! Pinned! Have a wonderful weekend, my friend! Isn't soup the best? I've never heard of adding vinegar to soup, but I'll have to try that! Thanks, Dawn! Isn't cauliflower the most magical vegetable? It tends to take on the flavor of other ingredients around it! I like to add potato, you would never know you're eating cauliflower it tastes more like cream of potato soup! Your recipe sounds amazing though. 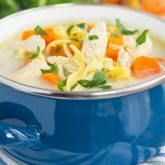 I adore soup season so I can't wait to try your recipe! Cauliflower is definitely magical! Thanks for the kind words, Christina! I love cauliflower, especially when Parm gets involved! This is a soup I could eat every week, too! Pinned! It's so good with the parmesan cheese! Thanks, Annie! I LOVE cauliflower soup!! I've never made it myself though but this recipe has inspired me to give it a try!!! Thanks, Anna! Hope you love this if you try it. I could eat soup every day...it's a favorite of mine. I love making a huge pot to eat for lunch -- it doesn't get better! I've never made cauliflower soup but I know I would love it. This looks so creamy and delicious Gayle and the croutons are the perfect topper! Isn't soup the best? Thanks, Marcie! Cauliflower soup is my favorite! This one looks very delicious and easy to make. Trying it next! Isn't it the best? Thanks, Mira! I love, love, love soup, too -- especially at this time of year. Your quick 30-minute recipe sounds delicious! It's a great way to get veggies into the diet when salads don't sound as appealing, too! Thanks, Blair! You're right, soup is even better than a salad sometimes, especially come winter!